last weekend i hit two chicago food festivals: andersonville's midsommarfest and "North Center's" (new neighborhood name to me) Ribfest. although it was probably in the low 80s, once we got into the crowds of Ribfest, the temperature shot up to what felt like 90 degrees. it was a bit overwhelming and we made our selections based mostly on which booth had the shortest line. while some might suggest that a long line indicates the better ribs, i'm pretty sure people were drawn into lines based mostly on herd mentality, not on any deeper knowledge of which place had the best ribs. the highlight of Ribfest was probably my rootbeer float. i get them about once a year and they're totally my favorite. yum! midsommarfest was not quite as food-oriented, but i did make off with a fabulous funnelcake. the festival is allegedly a scandinavian thing, but i didn't see a single scandinavian food both there. wait, is funnelcake scandinavian? hmm. maybe. your blog is awesome. i love reading about good food. especially since my culinary forays are now confined to the veggies and meat that will fit in a pressure cooker and provide for sahid's daycare lunches for the week. 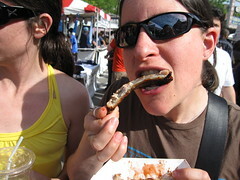 the photo of you gnawing on a rib suggests you are no longer a vegetarian...? may be in chicago the 2nd week of august, you around? at last, a summer photo! and blog! your readership is happy!! I believe funnelcake is Scandinavian. Otherwise I understand all other Scandinavian food is white.